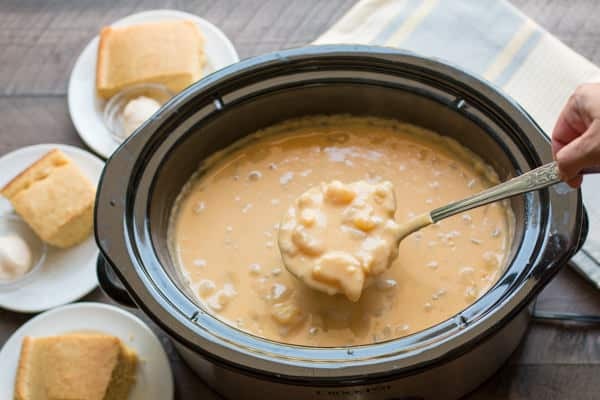 Do you love Marie Callender’s Potato Cheese Soup? Now you can make it at home in the slow cooker! Hi all! I don’t know if I mentioned before that I worked at Marie Callender’s for about 5 years as a hostess, and pie server, but mostly I waitressed. I was even the bookkeeper too! 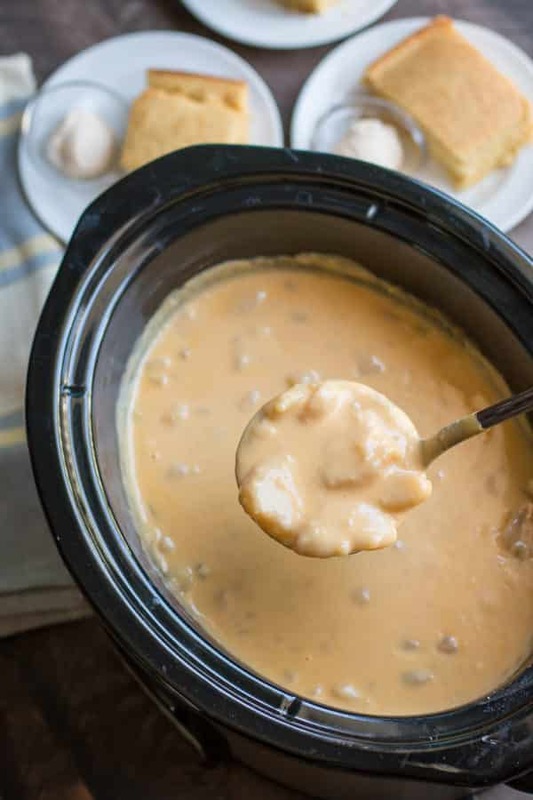 Marie Callender’s Potato Cheese Soup was the most popular soup. 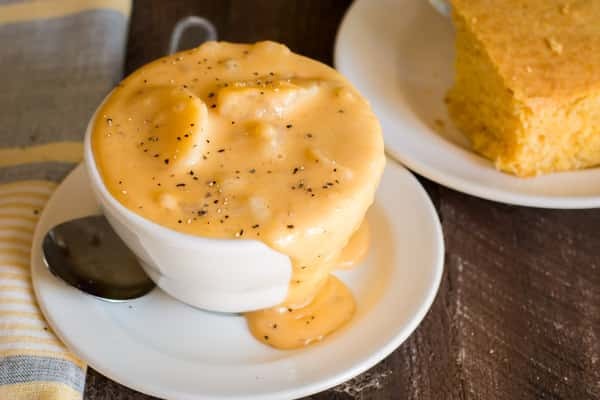 When I ran into people around town and they found out I worked at Marie Callender’s, they would always say I love the potato cheese soup and cornbread there! Sadly our local Marie Callender’s has closed, so I had to figure out how to make this soup at home. Over the years working at Marie Callender’s I learned what most of the ingredients were to this soup. Often customers would ask which soups of the day were vegetarian. I would have to go into the back and ask the Jimmy the cook. The potato cheese soup was not vegetarian, it has a chicken base he would tell me. Then Jimmy would go on how the soup has processed cheese in it, and a bit of regular cheese too. That’s all I remembered about the ingredients of this soup. I did some research by asking an old friend who worked at Marie Callender’s (for longer than I am alive!) if she remembered if the soup had celery. It does! She also reminded me that there was onions in the soup as well. Working at Marie Callender’s has so many fond memories for me. I met my husband there, the very first week I started! I was the hostess with the mostess, he always jokes. And where else can you work and have pie for breakfast? The beginnings of this soup is just broth, potatoes, onions and celery. After the base of the soup cooks for 7-8 hours in the slow cooker, I add velveeta cheese, and sharp cheddar. You will notice in the recipe that I did not add salt. There is plenty of salt in the velveeta and chicken broth. The soup turns out thick and creamy! Some of the potatoes get crushed when the cheese is stirred in, but that is a good thing. The crushed potatoes help thicken the soup. I made Krusteaz Southern Style cornbread, and honey butter to go with this. I haven’t seen Marie Callender’s cornbread for a while at the store, it may because I always grab the Krusteaz lately and don’t notice any others. You will love this soup! 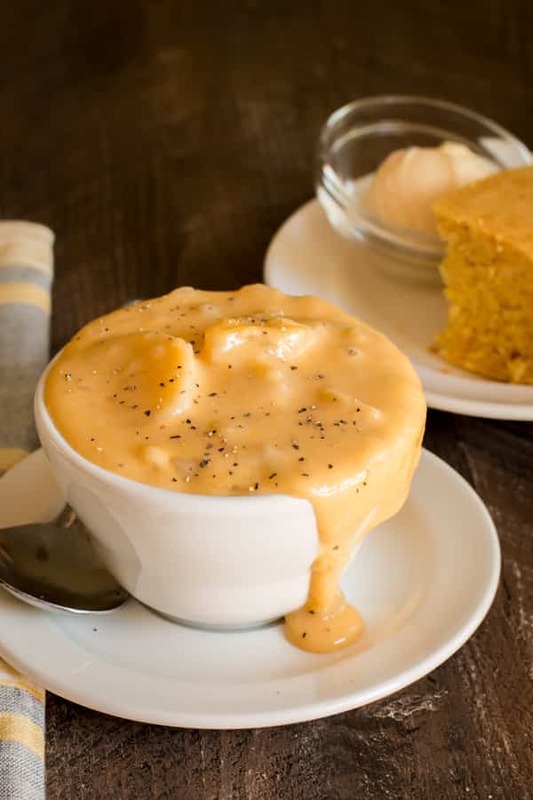 I wasn’t sure if I would like the soup with velveeta in it, but I think this is what most restaurants use because it really makes for a creamy cheesy soup. Have a great week! Add this add the end! Add the chicken broth, potatoes, onion, celery to the slow cooker. Cover and cook on LOW for 7-8 hours. Cut the velveeta into small cubes, add that and the shredded sharp cheddar to the slow cooker, stir gently until the cheese melts. Some potatoes will break apart, this is ok because it will help thicken the soup. Serve with cornbread and honey butter, enjoy! I used my 6-quart Crock-Pot for this recipe, though a 5-quart or larger will work fine. This sounds fantastic! Do you know if it will freeze? I know uncooked potatoes will not… We’re getting ready to become a household of 2 next week (our son leaves for college), and even though I’m a big fan of leftovers this would be way too many leftovers for the two of us! I may have to try to just cut in half if you don’t think it would freeze well. Thanks! Amy, I’ve froze potato soup before, and it doesn’t do well. I’m sorry. Yes maybe you can halve the recipe, or make this when guest come over. You can make this very easy soup much quicker in a Dutch Oven without the lid. 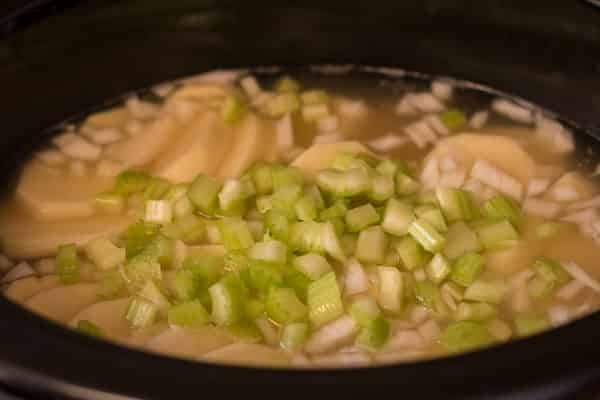 Just simmer the potatoes, onions and celery in the Broth for 20 to 25 minutes. When they are tender add the cheeses. To make less just cut the ingredients in half. Doing it on the stove top saves about 6 hours of time! To store in the refrigerator top with the lid. The Soup will be good for several days after being made so I always use the larger recipe. Makes Lunch for a few days so yummy! However if you are serving 4 I doubt you will even have leftovers! Cheese usually turns “grainy” if frozen. Another tip: this is even better using Fresh Chicken Stock! Make you own from simmering the bones from the carcass of a rotisserie chicken. Boil only the bones for 15 minutes with water to cover, Drain and rinse to get rid of scum, then add 8 cups water and 1 tsp. turmeric to cover, simmer for 1-2 hours. Can add aromatics like onion, garlic and carrot but not necessary. If you do not have 32 ounces then boost what you do have with “canned” stock. After the simmer, place a good clean hand towel in a colander and strain the liquid. Ready to use in the soup now! Complete with collagen, vitamins and minerals you do not get from canned broth! This process takes about 2 hours longer, but still 4 hours shorter than slow cooker. I make the broth as soon as I take the chicken off the bone, then freeze and use it in my soups. The Bone Broth makes a much healthier and more nutritious soup! Thanks for sharing your stove-top recipe! Hi Carol. I don’t see why not! It would probably melt the same. Thanks, Marie Callenders Potato Cheese was always my favourite in the restaurant.I will give it a try. more regular cheese would probably work fine! I found this soup too stiff and tasteless for my palate. Then my wife added a cup of bullion and it transformed the soup to delicious!! This is basically the same recipe I use to cook on the stove top and it takes about half an hour from start to finish. I seldom have fresh celery on hand as it perishes so quickly, so I substitute about half a teaspoon of celery seed for flavor and some dry parsley flakes. Thicken the soup with a little flour and butter or steam dumplings on top. 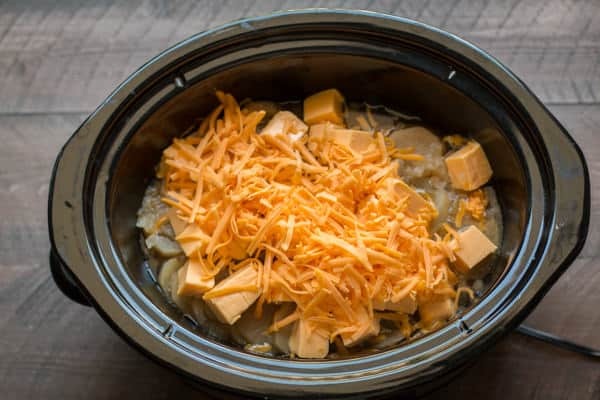 Two or three tablespoons of shredded cheddar cheese on top of the soup in a bowl is plenty and melts quickly with the heat. This is absolutely our favorite soup and is even better the next day. You had me until I read “velveeta”. Bad bad. That’s what they made it with! Make your own substitutions. Making today for a rainy day & been cold at night. I did think it was weird not adding garlic so I added 1-2 pcs. Great idea on the garlic. I’m glad you are trying it.